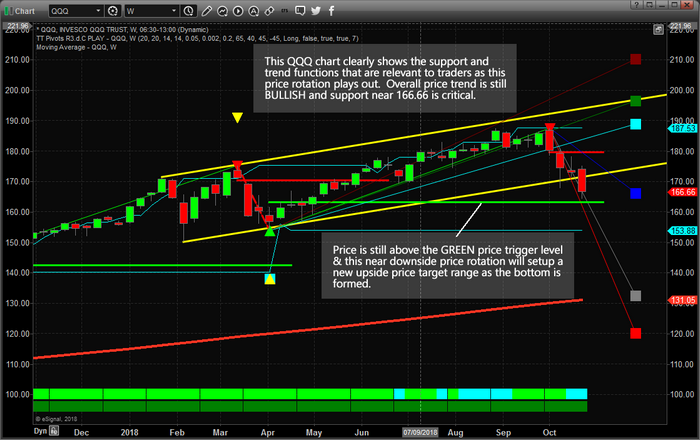 US Elections May Trigger Major Market Bottom – PART 1 – Technical Traders Ltd. Almost like clockwork, our research team, at Technical Traders Ltd., predicted on September 17) the US stock market would turn lower and attempt a 5~8% downside move on or after September 21 headed into the US mid-term elections. Our analysis of the potential downside move was related to our price modeling systems expectations that a common predicted downside target existed between -5% and -8%. Our researchers did not believe the markets would fall much below -10% before hammering out a price bottom and finding support. Our theory is that this phenomenon has become even more volatile in recent years and global political ideals have become further polarized. We believe when a sitting US president that has served for two terms is leaving office, far greater volatility enters the global markets typically. We believe that mid-term US elections, depending on the political climate at the time, may or may not reflect in broad global market concerns and volatility. 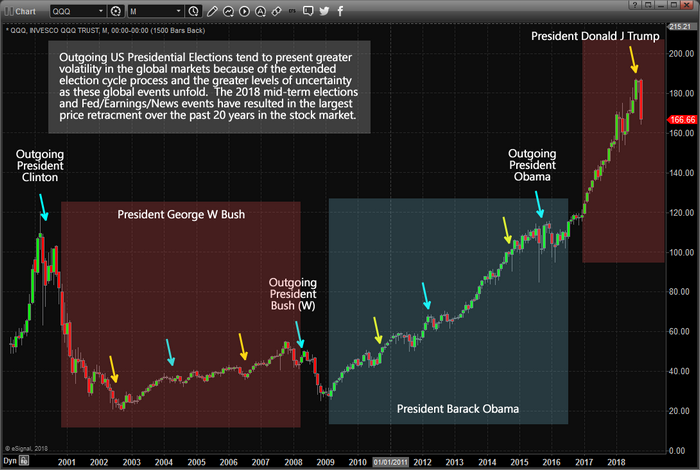 We’ve highlighted major US Presidential elections and US Mid-Term elections on the chart below so you can see how volatility and price rotation increase or decrease depending on the political climate and uncertainty associated with these US elections. We’ve highlighted 6+ months (or longer) before Presidential elections and a few months before mid-term elections. In the next segment of this research article, we’ll take a look at additional technical, price and modeling systems that support our belief of a major bottom formation setting up in the US equity markets and how election cycle events should be played for success. This current downside price rotation has extended to below our expected levels – much like a deeper “washout low” price formation. We continue to believe the next 7+ trading days will hammer out a bottom formation and that the US equities markets will resume an upside advance shortly after the elections are completed and throughout the remainder of 2018.